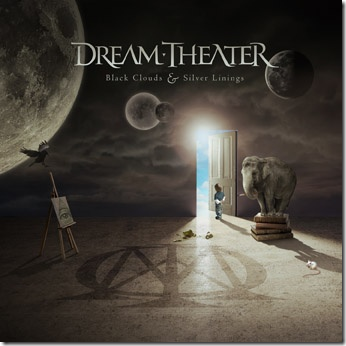 dans.blog: Dream Theater's "Black Clouds & Silver Linings" releasing on June 23rd! Dream Theater's "Black Clouds & Silver Linings" releasing on June 23rd! This is a few days old, but I just stumbled across it. Dream Theater's 10th studio album, Black Clouds & Silver Linings, is being released June 23, 2009. I really loved Systematic Chaos (although the title song was my least favorite on the album) and I've get recently gotten back into Train of Thought. The album is being released on vinyl as well as a 3-disc Special Edition that will contain extra CDs—one, an instrumental remix of the album and two, a six song cover CD. Yeah - I like it when the # of songs is few - that means long jams :) Would love to see this tour with Zappa Plays Zappa. Me too, I'm anxious to hear Dweezel. One thing I hate about seeing them with this many bands is they play a short set. I've always enjoyed the shows that they play 2+ hours. I saw the last Progressive Nation show and they were spectacular--as normal. I just went to DT's My Space page and saw the song Forsaken has 1+ million listens--not bad for a band most people have never head of. Their 10th studio album? Wow! I had no idea they already had that many! Of course, I haven't been into the music scene much in the last few years. I got into Dream Theater way back when they came out with "Images And Words", but I kinda lost interest after "Awake". So, yeah, it's been a while since I've heard anything from them. I first heard DT back in like '88 when a buddy turned me on to "When Dream And Day Unite." I remember when I first heard "Pull Me Under" on the radio, I said "Damn, that sounds like DT, but with a different singer." I never really expected DT to be on the radio at the time, because they were still very unknown. I've been following them ever since. If you liked Images And Words (which is still probably may favorite from them--it's certainly my most listened to album of all time,) then I'd recommend checking out "Scenes From A Memory" (aka Metropolis Pt 2.) It's concept album and a fantastic album all around--probably my 2nd most listened to DT album. Saw ZpZ last fall and it was awesome. I'd be amazed if DT came anywhere near here on tour though. Even though we have 3 college universities here we are in this odd hole where concerts skip by us. They hit Atlanta then Virginia/DC. I'm sure they'll be playing new tunes on the upcoming tour--they've always been a band who would play new tunes before releasing them on studio albums. For years "A Change Of Seasons" was a song they only played live. can someone pass the Linck Dawnload to do the album? Yeah buddy. .this is the first time i send a comment 4 this blog. .i'm from indonesia. . I liked DT when i was in junior high scholl. .i knew it from my friend. ."pull me under" is the first song i've listened at that time an i'm not so interested,but after i studied in senior highschool. .i knew "Spirit Carries On" and i think this song was very amazing. .so,since that time i like DT,although many of my friends and my guitar's theacher didn't like DT at all, but i still like DT. .and about this tenth album. .i'm sure that this will be a great masterpiece. .but, i'm worried if in my country there is no DT album sells. .
Cant wait for this release, love all their music. Best band ever. Fave albums atm would have to be Scenes from a Memory, Six Degrees of Inner Turbulance and Train of Thought. i hope that the new album will be more progressive and less metal,,, systematich chaos is a good album but i think that Dt actually is going to another style ... sorry.. semi-poor english .__. Have heard the first two tracks of the album! Gonna be great again!!! The entire cd has been leaked. My son found it via Azureus and downloaded it to itunes. I heard it in its entirety yesterday...better than Octavarium or Chaos. Shattered Fortress is a masterpiece...Withered and Nightmare amazing. Rite of Passage (single) the weakest track on the cd. Petrucci really shines on this one...amazing. This record is freaking awful of course the public will love it cuz they stuck with the "Dream Theater" formula at least through Train of Thought. It has "classic bits" here in there but there are also many overtures to other bands like Rush (Best of Times, Count of Tuscany), Metallica (Shattered Fortress riffs), and Opeth (A Nightmare to Remember - the entire stupid song). Dream Theater feels like a cover band now. They rip off so many bands' ideas and have nothing original since 1999's Scenes from A Memory. Thats the past decade devoid of any albums save a song here or there. They increasing frustrating to listen to like Pearl Jam, Radiohead and Tool. Its like the equivalent of Star Wars, Star Trek, Terminator, Spiderman, Batman and all those stupid movie franchises. You will always find mistakes for what it is. They will never achieve the greatness of the original band when Kevin Moore was still there 15 years ago for his last album, Awake. I've been disappointed with BC&SL to date--it was definitely a disappointment on the first couple of listens. I did like Systematic Chaos a lot and Train of Thought really grew on me over time. I do agree that SFAM was there last truly spectacular effort. Funny enough, I just moved Live from the Marquee to my iPhone to hear some live Kevin Moore in DT.